William and Kate have begun their day in Charlottetown, Prince Edward Island at Provence house , the birthplace of confederation. William said 'It is quite the moment for Catherine and me to be standing here in Atlantic Canada, in front of in front of Provence house where Canadian confederation was forged'. 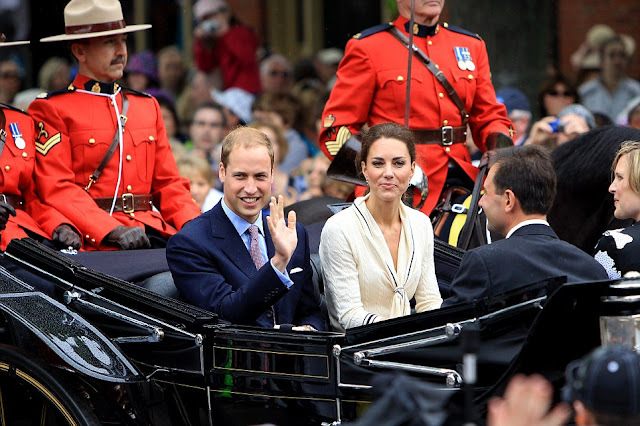 The couple then took part in a walkabout where they greeted over 30,000 tourists. It has also been revealed that at Ottawa's memorial park while talking to a military wife. Kate revealed how she deeply worries for William while he's at work. 'I always worry but my job is to support my husband. You should always support your husband. I worry when William goes on a mission. I find it very difficult. You always fear for them not knowing not knowing if something is going to happen and it can be very hard'. The much loved Duchess perhaps found it easy to relate to a military wife who would understand the same fears. Kate is wearing a Sarah Burton for McQueen cream and navy knit dress with her prada pumps and sapphire earrings. Her hair is tied back (which I love on her) The dress isn't one of my favourites but I still think we will see her wear something vibrant and colourful before the tour is over. It was designed with one of Kate's favourite books in mind 'Anne of green gables'. Next the couple will compete in a dragon boat race. Thank's for sharing this beautiful photo's with us from there visit to Prince Edward Island. Thank you so much for your kind comments Rita! It has been a wonderful tour thus far. I read William and Kate may be planning a trip to Japan soon!